Even though I got rid of my own pair, I'm still on the search for the lightbulb heels in black velvet and gold. I just couldn't get down with the silvery glitter of mine. Black is always better for me anyway. So if you ever see a pair, don't be greedy...let me. lol, okay :P omg i love that take away box. cliche? yes. but who cares. the light bulbe shoes are so original but i agree with you with such a pair black is better and best! 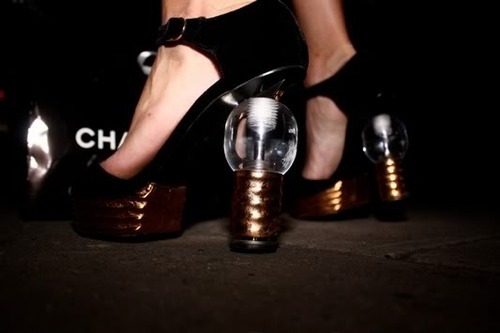 The light bulbs and the gun heels will forever be in my no-holding-back list if I ever come across a pair. Serious love! I agree, the crazier Chanel pieces are just more fun!